This is Steve & Patti Stump's home page! 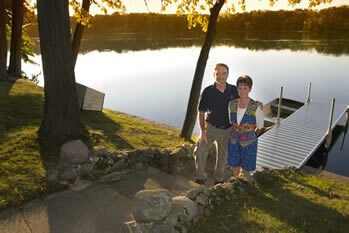 Steve and Patti still live in the family home on the St. Joseph River. Patti Runs the household and tends her garden and I run a Construction Business named Stump Construction of Michiana plus a new endeavor called Steves-Images. Some of our interests are computers, music, biking, and photography. Living on the River is great! The spot we live at is just above a hydro-dam. The dam makes the water area larger where we are and resembles a lake. Some residents use the water for boating, skiing and fishing.